Kriya Yoga is a process of mental purification that teaches meditation through techniques. The fundamental belief of Kriya Yoga is that all of us are miniature version of the whole cosmos, a microcosm or an evolution of a new world within the microcosmic world. The followers of Kriya yoga also believes that the most holy supreme creator is a part of us hiding beneath our body, and activating every action through the breath. The name Kriya is meant as any work “kri” is being done by the power of the indwelling soul “ya”. The different cosmic forces controlling, air, fire, water and earth also controls the different activities that we do, namely, religious activities, relationship with everyone and everything, food, pregnancy, and everything performed by the human body. Yoga on the other hand is the conjoining of these correspondences between microcosms and macrocosms. It is the full acceptance and belief behind the union and interaction of the individual self and the supreme self. The study and science of Kriya yoga has a divine origin and was not created by human means and intellect. The modernization for this ancient yoga meditation method has begun in the 1860’s with Babaji and has been handed down to the present Kriya yoga lineage of masters directly through the Master to disciple method of teaching. The disciplined path of Kriya Yoga consists of many different kinds of teaching with different angles to it. One looks at it as a process of beginning with self introspection through breathing controls. 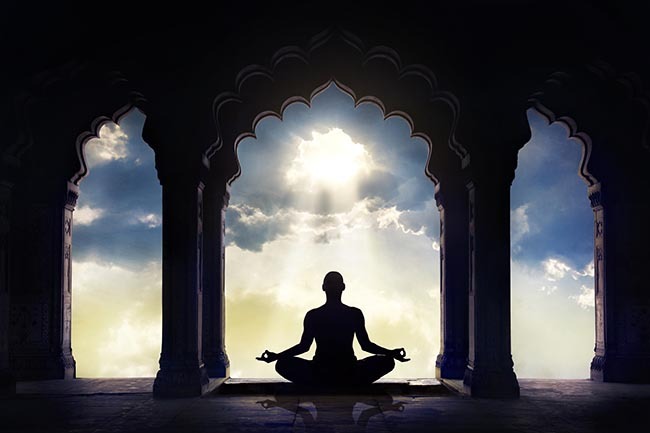 It is also believed in Kriya yoga that that by enlightening the three qualities of light, vibration and sound simultaneously with proper concentration, posture and breathing through application of a series of techniques, a Kriya yoga disciple is able to penetrate the deepest levels of the unconscious mind. Through this they can communicate with their inner gods and obtain a fulfilling calmness within them.